The following is a guest post by Adrienne from Design Roast. Tumblr is a must for any author looking to build a following of readers. It is a platform to promote your writing within a tight-knit community, as well as a place to dynamically tell the world about you and your books through videos, quotes, photos, reblogging, links and just some straightforward text too. The most popular way to share on this site, however, is through the creative use of animated gifs. What do all of these forms have in common? They’re short, easily digestible content. Today, a variety of literary figures can be found on Tumblr, including book reviewers, publishers, booksellers and, of course, authors. 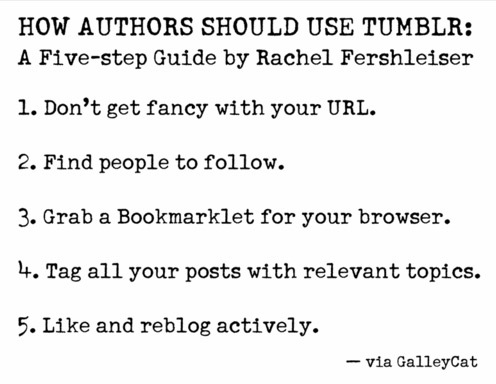 Tumblr has many opportunities for authors, so keep reading to learn how to get started. For starters, create an account. This means uploading a photo of yourself and creating a unique username. Since your username will be a part of your tumblr URL, choose wisely. 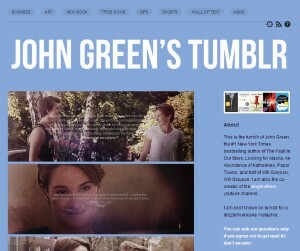 Some established authors, like John Green, have gotten creative with their username — his is fishingboatproceeds. If you’re looking to build a following, consider using a familiar title from your books, or simply your name/pseudonym. The rest of the account settings are pretty straightforward. In the “About” section, share a bit of your background, as well as a few of your book titles. You can also set your preferences by allowing, or not allowing, replies from people – and since you’re building a community, it’s a good idea to allow these comments. Another great feature is the “Ask” section. By turning this on, your readers can ask you questions; just be prepared for them to potentially ask about everything from your favorite place to write to further details about your characters and when your next book is coming out! There’s a variety of functionality you can add to your site; one way to really stand out is to personalize the look of your site with a theme (found under Settings > Edit Theme). If you have a header or background that you’ve designed, you can upload these here. Alternatively, you can simply change the color background to set a tone for your tumblr site. This area of the Tumblr settings even gives you the ability to change your site’s font. Just keep in mind: Every setting you choose creates an impression about you and your books. Choose colors that will be pleasing to your audience, and fonts that aren’t too hard to read. If you need assistance with your design, check out the “theme garden” by clicking on Settings > Find Themes. This “garden” is full of choices that can reflect what you and your writing are about. There’s a plethora of options – they even have a storybook theme perfect for children’s authors. While some of these themes are free, others do cost a nominal fee, which is much less than what you’d spend hiring someone to do the design work for you. Plus, you can do some customization after choosing a theme, such as change up the features – color, font, etc. – to really make the site yours. Just keep in mind the theme will only change how your readers see your page; it won’t change your home feed (where you’ll make updates and monitor other people’s pages). Many of the themes available through Tumblr include the ability to add comments through Disqus. If Disqus isn’t enabled, the only way people can interact with your content is by liking it and reblogging it. If you’re looking for more interaction on Tumblr, start by making a Disqus account and then adding your Tumblr site under “Your Sites” in Disqus. 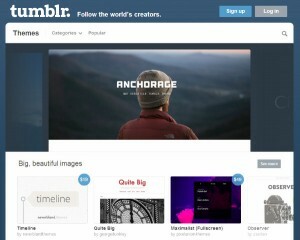 Next, visit your Tumblr settings and choose Settings > Edit Theme > Customize. Once there, put your Disqus-supplied username in where it asks for your “Disqus Shortname.” Disqus also gives you the ability to check if it was installed correctly and allows you can set rules in order to moderate your comments. Quotes: Not only can you offer an excerpt from your books, but you can also quote reviews of your work or even just quotes by others who inspire you. Then, you can comment on the quotes you post. Videos: Think book trailers for your work or just content you think has some relevance to your brand and the topics you love to write about. Images: Have a new book coming out? Tease what it’s about through images that inspired you while writing, and then post the book cover to Tumblr. Links: The world is your oyster when it comes to posting links. Share articles you’ve written around the web, press coverage, links back to your personal writing blog where longer text content resides and more. Like videos and quotes, you can provide some commentary on any link you post. GIFs: Animated gifs are by far the most popular way to tell a story or share a thought on Tumblr. They can be about a TV show you’re inspired by or simply something fun to share with your readers. Find gifs to use on Giphy. No matter what medium you use to blog on Tumblr, be sure to tag each and every post with keywords, so users other than your followers can easily find you. For starters, start following others. You find others by searching their email, URL, or username. Alternatively, search for topics and blogs that interest you. You can focus on publishing-related sites, but follow sites that simply interest and inspire you too. Some people might follow you back, some might not, but it’s a start within the community. As for gaining followers and readers of your own, simply interact with the site. Like other people’s posts and reblog. Spread the love among Tumblr, and Tumblr will spread the love right back. While the functionality of Tumblr is simpler than writing a lengthy blog post every day, its offerings are immense. Don’t be intimidated by the site; just get started with an account, explore hashtags and other people’s pages and have fun with it. You never know how it might help you in your next writing endeavor! Adrienne is a freelance writer and social marketer who loves analyzing social media campaigns to see what works. To see more of her work, check out her blog about design. I have a Tumblr account that I’ve done nothing with so far, and I also have a website through godaddy. The website is a work in progress. (I’m just getting into the marketing aspect). 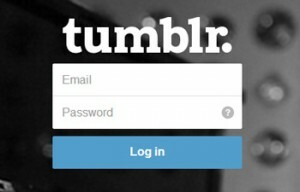 What is the difference between Tumblr and a website? Is it essentially the same thing? Thank you. Using social media is always a good idea. But there are so much – tumblr, fbook, g+, linkedin… it’s difficult to remember and share all those links. I solved using http://wallof.me/ – to have just one address for all my social media links! There are six simple and easy Tips to lose belly fat by making small changes in your daily diet follow these six best and simple steps for best results.